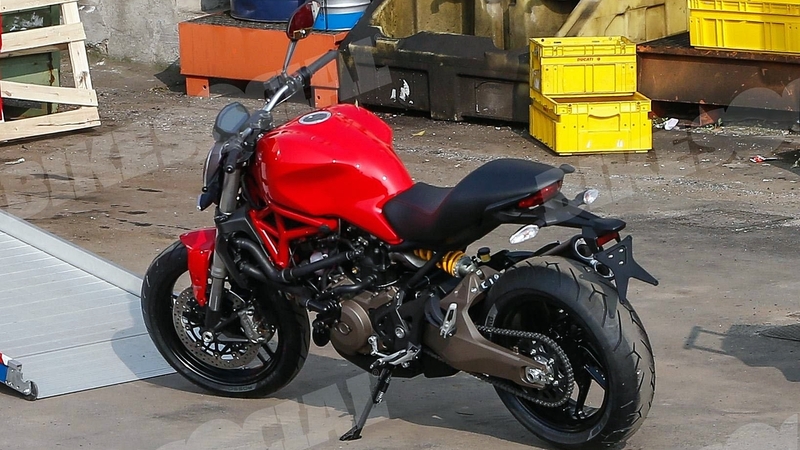 No surprises here, the 2015 Ducati Monster 800 was the next logical step for the Bologna-based manufacturer. This beauty of a bike has been spotted testing by the blokes at BikeSocial. Featuring a 821 cc liquid cooled engine, the 2015 Ducati Monster 800 is expected to produce close to 110 HP. With looks almost similar to the recently unveiled Ducati Monster 1200, the new Ducati Monster 800 looks pretty much production ready in this photograph. The only changes that we could notice was that now the swingarm was double sided and there is a slight design change in the tail section. The Monster 800 is also expected to come with traction control and ABS as standard. The feature that is really new in this line of Ducati’s is that fact that they all move to liquid cooling. Something that is really needed in this day and age. The engine on the 2015 Ducati Monster 800 is the same as that on the new Hypertrada so expect about the same power ie. 110 HP and 89 Nm. Expect a launch in the next couple of months. More details as it happens.